A great piece of the Franciscan Ivy dinnerware. 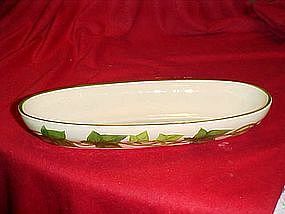 This is the celery or cracker dish. It measures 10 1/2" long. A hard to find piece to this set. It is marked with the semi circle stamp *FRANCISCAN* Made in California. It is in pristine condition. This set was shown on an I Love Lucy show, which has made it very popular. I have other pieces listed in my catalog in this pattern.